We also get a bit more about Dolls’s past and a nice confirmation that there are demons and the supernatural out there beyond Purgatory and the revenants. It also means that his organisation has been going around the world to fight demons and monsters – which has left Dolls with some difficult memories and a lot more knowledge an access to some shiny artefacts. I like this because it confirms that it isn’t just this town that is special but also that Dolls is an expert. So far Dolls has been the professional but he hasn’t been necessarily a expert – he’s done a lot of things like take Wynonna’s gun and rely on Waverly’s research which has implied that, despite his position, he really doesn’t have a whole lot of an idea of what’s going on. But this episode establishes that he doesn’t have a whole lot of local knowledge, but his general knowledge and history of the supernatural is greater than any of their’s. Which is where we also come to Waverley, whose local knowledge is excellent, her research unsurpassed and that she has worked really hard all her life to become an expert in this. She has learned a lot, mastered ancient languages and generally become a font of knowledge and hard work. Which is why, despite her general sunny attitude, she resents the hell out of Wynonna: after all Wynonna left, Wynonna rejected her heritage, Wynonna did nothing while Waverley has worked so hard but, in the end, Wynonna is the chosen one. It bugs her a lot. I really like this line of reasoning and wish more shows would pursue this. How many works of fiction have a “chosen one”, an every day person who rises up and becomes super special because they are “chosen” while surrounded by people who have been working/fighting longer, trying harder, truly preparing themselves, sacrificing and end up becoming the side kicks and supporting staff to the “chosen one.” More shows need to look at this. 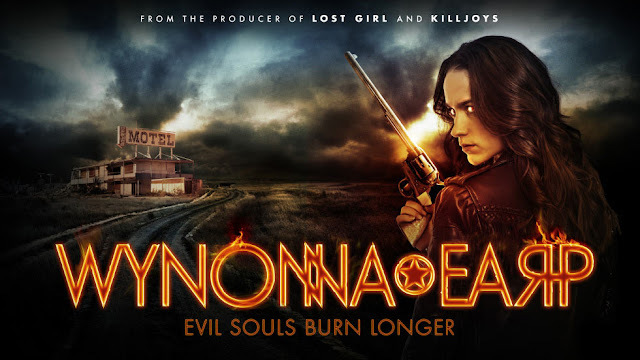 This leads to a lot of death and a lot of unpleasantness from Wynonna’s past when she had a pretty terrible childhood, made some severe mistakes and gone through some generally bad things. This means, when she is targeted, she has some pretty desperate flailing to try and get people to forgive her. It doesn’t go well. We also poke some more of Doc’s past – seeing more of his involvement in the supernatural and the fact he was dying before he made his immortality bargain. A bargain Wyatt disapproved of. I still wonder exactly what Doc’s motives are, even if he’s working with the Earps out of any preference of his own or because Bobo is forcing him. He’s certainly not giving up a lot of information to Wynonna – though they now know about the Trailer park full of Revenants.